Our school started in 2018 at Vastral. A seed was sown and the sapling was nurtured with care, passion and commitment. The sapling has blossomed into a sprawling tree: The AIS, is an English medium co- educational senior–secondary (10+2) institution affiliated to the Gujarat Board. The school is located at Vastral, off. S P Ring road, Near Madhav Farm, Opp. Sunvilla Bungalows, Ahmedabad. approximately 13 kilometres away from Kalupur Railway Station and 14 kilometres from S.T. Bus Stand ( Geeta Mandir ) Ahmedabad. Life at AIS, centers on a shared commitment to academic excellence, intellectual growth, appreciation of arts, high standards of ethical awareness, sportsmanship and community service. Depth and variety are added to each student's life by the school's traditions and accessibility to a broad curriculum. Students develop their own abilities and talents, and discover their potential to the fullest. This is achieved in an invigorating and competitive atmosphere created by good facilities and exposure under the guidance of a highly qualified and dedicated faculty members. The social and moral values ingrained within a broad and balanced curriculum help to promote confidence, critical thinking skills and leadership. In other words AIS offers a comprehensive and holistic education. Arpan International School’s central theme is a Clean, Modern and Responsive. AIS theme comes with a creative design layout which is suitable for education sites, learning management sites, university, school, primary school, business and similar websites. AIS theme consists of well-organized components that are easy to modify. Latest news section added on the homepage to showcase news. Team section also included with the theme along with social share. “Why go to graduate school?” is a question many students ask after completing their undergraduate degree, unsure of whether grad school is really the best way to help them achieve their career goals. Both the cost in tuition fees and the extra length of time out of employment can mean that applying to graduate school is a decision not to be made lightly. Although last in this list of reasons to go to grad school, gaining a qualification which is recognized by employers around the world is incredibly important to many prospective graduate students. This is particularly the case for international students and students wishing to work abroad. The School operates___Bus Routes as listed below. The details of bus routes, pick-up and drop-off points, time schedules, and bus charges will be provided by the School at the time of admission of students. The School does not have any plans to extend the bus routes, at this time. Schools play an important in every person life. It help to gain academic knowledge as well as other personality traits. It play an important role to convert impressionable mind into a better human being. Along with bookish knowledge, schools will help to acquire knowledge of life. It gave a chance to children to acquire knowledge in variety of fields like mathematics, social studies, politics, history and numerous subjects. Schools also teach how to work in a team, share things with others, discipline, punctuality, manners and many other things. Therefore it is important to choose right school for a child . AIS follows the GSEB syllabus and NCERT Course. We have classes from Nursery to XII ( Science- Commerce) . I truly believe that AIS is one of the finest schools in our area. AIS is dedicated to providing a quality education for children. My youngest daughter is studying at AIS and has such happy memories of her. As a staff/faculty member, over the years I have had the privilege of working with the most dedicated teachers, administrators, and staff possible. All three of my children were educated at AIS from Junior to 8th grade. it was the best decision my husband and I have ever made. The education they were given at AIS provided an excellent framework for their future success in high school and college. AIS is a very special school. It is not only a school, a place for learning, but it is also a home in many ways. The administration, teachers, parents and students all have a connection and a bond that unites us . Not only are academic subjects taught, but focus is also placed on developing deep and meaningful relationships. Fond and funny memories are held close to our hearts and are shared over a lifetime. The students use their intellects, talents and gifts to stretch themselves and become the best they can be. Most of all, AIS is a warm and welcoming home where students feel safe and loved. AIS is truly a “gem” serving families from the vastral area. Students are challenged by a dedicated team of caring, professional faculty who work collaboratively to instill core values in each lesson every day. For the community, AIS provides an invaluable resource. Through prayer and service, AIS students demonstrate “faith in action” throughout the year. By providing opportunities in a variety of disciplines, spiritual growth is a natural result. When a visitor enters through the doors of AIS, they are greeted warmly and welcomed. They know they are in a special place. Here at AIS I am learning how to use this key that will open doors to a more successful path. choosing to study in another country has been one of the best decisions I have made. I recommend AIS because I have not only learned new words and grammar, but I am also preparing to live in a more competitive world. Here I am learning and becoming more disciplined in my studies. I am so happy and thankful to be part of the AIS of Languages great family. It’s a place where learning English is fun, easy, and comfortable thanks to its dynamic and people. Ricky, you are one of my favorites. Thank you for the support you give us day after day. Coming to AIS International Vastral Center has been an amazing experience for me. 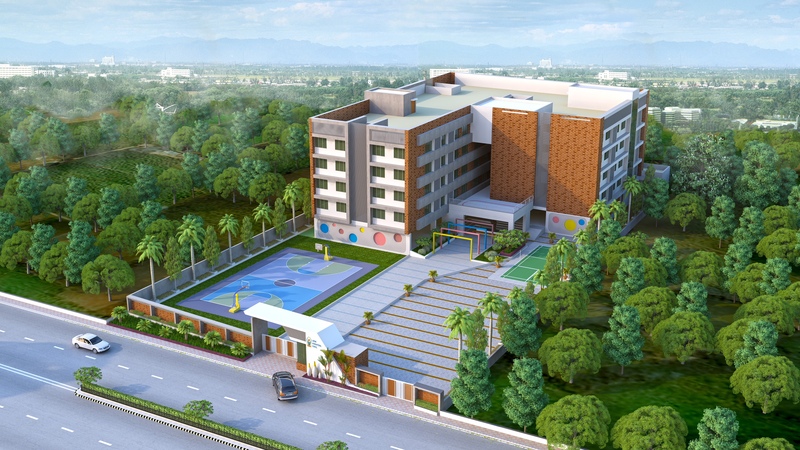 The school is in the middle of the fast growing financial district of Ahmedabad. It’s easy reachable by the metro mover and by car. The classrooms are spacious and eco friendly. Each class is equipped with the most modern teaching tools. The teachers are always well prepared and they make each day class exciting and challenging. The best thing about AIS is that you are in class with different cultures of different regions and states. It is a true melting pot and it teaches me about the world. I would highly recommend AIS is a fantastic experience. When I came to the school for the first time, I didn't imagine how easy is to learn a new language. Obviously, because we have the best teachers, carefully prepared to teach by the easy way. I’m so happy to be part of this amazing school. Here isn't just a school, is a great place to make new friends, know more about new cultures and the best part: Learn English having fun! I am so glad to be part of AIS family! If you want to learn, have fun, and make new friends, join us! I just have to say: Thanks a lot AIS school! Thank you AIS for helping me improve my English. Everyday my English improves a lot. Before I came to AIS I could not understand people who spoke to me in English. But now, after one month of studying English with my teachers, I can speak to strangers without embarrassment. My teachers are very helpful and I enjoy their classes every time. I am never bored. I am learning and having fun everyday.